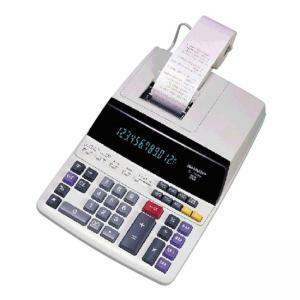 Heavy-Duty Print/Display Calculator features Microban protection, a large blue fluorescent 12-digit display with punctuation and two-color heavy-duty printer ribbon. Print 4.5 lines per second. Microban antibacterial protection inhibits growth of bacteria, mold, mildew and fungus that leads to product deterioration. Functions include four-key memory, clock/calendar, markup/profit margin, floating or fixed decimal (6, 3, 2, 1, 0), add mode, constant modes, item count, conversion/average/time calculation, and a grand total key for quick, efficient calculations. Calculator runs on AC power.